At Bontrager Builders Group, one of our favorite types of projects is beach homes. Waterfront houses allow for a relaxed, calm environment with quiet, yet beautiful color schemes. The exterior of this home on Navarre Beach is striking but still has the charming attributes of a cozy beach cottage. Our homeowner asked for elegance and quaint details when it came to the outside of their home, and we delivered. The interior of this home matches the picturesque exterior with its neutral and refined color scheme. The colors throughout the home reflect the colors found naturally on a beach. The wooden details remind us of driftwood, the glass ornaments of seashells, and the soft gray tones of the deep sea during a gentle, stormy night. This beach home’s kitchen is never over-the-top; instead, it welcomes its guests with a casual atmosphere that soothes. The hardwood floors are light, nearly matching the sand just a few steps from this house’s front door. The breakfast bar adds to the casual nature of this eat-in kitchen. Although this home is large and grand, it maintains a down-to-earth environment. The owners of this home can enjoy a spacious and relaxing front porch that faces the sea’s gentle waves. Imagine sitting on a comfortable chair on this deck, the salty sea breeze tickling your nose, and a riveting paperback in your hand. This porch melts into the surrounding sandy environment as a man-made extension of the beach. At Bontrager Builders Group, we enjoy remodeling spaces as much as we love creating new ones. If you have a vision for your home, give us a call at 850-444-9797 to schedule a free, no-obligation consultation. We’d love to help make your dreams come true. We love when a client comes to us with a unique request to build something that fits their lifestyle, tastes, and passions. Because of its rustic charm and beautiful detailing, this home is one of those projects. The exterior of this home nearly blends in with the green scenery that surrounds it. This home doesn’t disturb nature, it enhances it. The green paint is not garish; it is a classic, mossy color that works well with the exposed brick accents. The brick that makes up the steps and columns of this home is a rich red color that enhances the home’s other unique characteristics. This home’s back deck is a unique take on the classic Southern porch. Wooden chairs are placed strategically to encourage long, meandering conversations between friends and family. The back porch is screened in to prevent any mosquitos from intruding on those warm chat sessions. The ceiling is custom-made, with slabs of wood carefully covering the space. Unique lighting fixtures also adorn the ceiling, giving the atmosphere a rustic, yet modern feel. We love how open, yet cozy this back porch feels. The flooring is just the right color, brown, making visitors feel like they are truly sitting in the woods. The green walls simulating trees connects with the soil-colored flooring to create a natural experience for those sitting on the porch. The bench that hangs from the ceiling is reminiscent of childhood days swinging from the backyard oak tree. When you walk inside the home, you’ll be greeted by beautiful wooden paneling on the walls and a contrasting wooden floor that warms up every single room in the home. The wooden features brings a bit of nature into the kitchen area and the rest of the house. The forest theme in this home strikes just the right balance. We absolutely love this spacious custom bar that is equipped to serve every guest’s preference in food and drink. The counter sinks into the wall and features modern recessed lighting to make sure that the tender of the day has the best possible space to whip up refreshing drinks. This bar is made to serve friends and family, and it is well-equipped to do so. The kitchen extends the forest theme of earthy tones from the exterior of the home and brings it into the heart of the house. The counter tops in this kitchen are a unique green granite that emulates the trees that surround the home. The wood paneling on the walls in the rest of the house are also in the kitchen with the dark-wood cabinets providing a nice, natural contrast that highlights the rich warmth of the home. The lighting fixtures drop low and are placed over the breakfast bar while a chandelier hangs in the middle of the kitchen. The abundant lighting throughout the home also contributes to the warmth and comfort that the property exudes through every detail. It’s all in the details, and this home has a lot of them. This custom staircase is a beautiful light wood that stands in contrast to the wood paneling on the walls that we’ve seen throughout the house. The closet beneath the staircase nearly blends in as the door is made of the same wood as the wall paneling. The other wooden details such as the cuckoo clock and the beautiful cabinetry below it serve to add depth and detail throughout the space. When we step into this home, it’s as if we’ve traveled back to a simpler time, and we love it. Bontrager Builders Group excels at bringing architects, designers, and subcontractors together to create engaging, charismatic spaces that help businesses grow and excel. Let us know if we can help you transform your business facility into its best, most effective version of itself. Call us at 850-444-9797 to book a free, no-obligation consultation, and check out our other blogs and our photo gallery for more home inspiration! At Bontrager Builders Group, not all of our projects are massive undertakings, but we give the same level of attention to each remodel or new construction that we take on. For instance, we remodeled this master bedroom, along with its bathroom and spacious walk-in closet. Even though it was a small project, we made sure that our clients’ vision was at the top of our to-do list. This remodel is ocean inspired. The varying shades of blue are ocean themed, and the decor brings elements like seashells or mermaids into the room, creating a cohesive yet interesting space. In addition, we brought warmth and comfort to the room by adding an in-wall fireplace, making this master bedroom an elegant, upscale retreat. The custom details in this room are endless. We love the combined in-wall shelving and cabinetry. The white of the unit contrasts well with the blue on the walls. The unit is not only beautiful; it’s also functional. The shelving can be used to show off various knick-knacks and treasures, while the cabinet can be used for storage purposes. Also, the flat screen that hangs on the wall is modern and blends in with the decor, and it also works well with the fireplace because it corresponds in shape, size, and color. Let’s move to the walk-in closet. This closet has plenty of space for hanging clothes, and it also features unique and functional shelving for shoes and other accessories. We implemented an island in the middle of the closet for extra counter space, adding an unexpected touch to the large closet. Also, the chandelier above the island adds an interesting focal point, and it works well with the ocean theme (it almost looks like a jelly fish!). This project’s connected master bathroom is a show stopper. It features beautiful, unique tiling that works well with the underwater theme, and the white appliances, counters, and cabinetry correspond with the bedroom’s similar color scheme. As this project is a custom one, there are many distinct details that can be found only in this space. 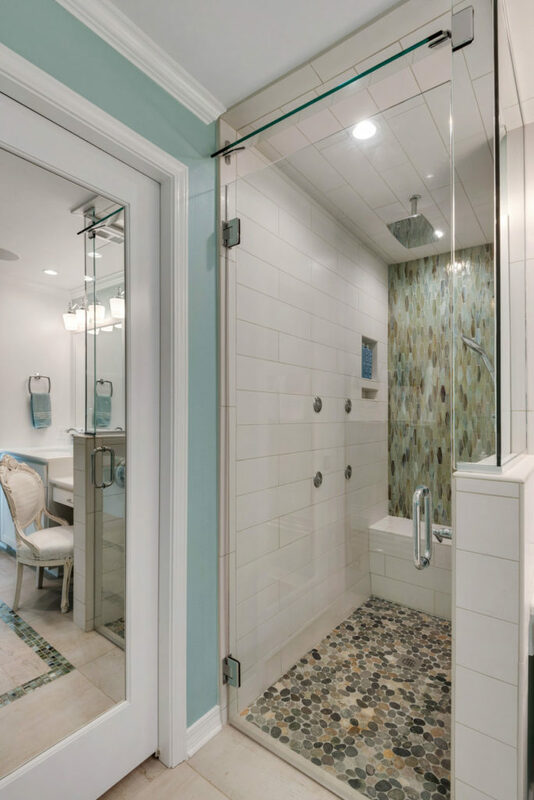 For example, the glass divider between the toilet and the bathtub features an illustration of a mermaid that continues this project’s ocean motif subtly throughout the bathroom. The toilet, bathtub, shower, vanity, and sink are placed so that the bathroom resembles a galley on a boat, all in keeping with the clients’ theme! The fireplace in the bedroom runs through the wall into the bathroom, and the bathtub features a beautiful fire-side view, while the adjacent window moves from blue to green, simulating the ocean’s colors. The bathtub is shaped for relaxation and rejuvenation, and its white color matches the trim and other bathroom amenities. Another chandelier like the one in the roomy walk-in closet hangs above the bathtub, keeping the suite’s theme cohesive throughout the area. Just like the bathtub, the shower features custom characteristics like a simulated pebble shower floor, gorgeous back splash, and a rain shower head. The shower also features a tiled bench. In addition, the glass shower door allows the space to flow openly rather than be cut off by solid door. This space is a wonderful example of our custom work. At Bontrager Builders Group, we enjoy remodeling spaces as much as we love creating new ones. If you have a vision for your home, give us a call at 850-444-9797 to schedule a free, no-obligation consultation. We’d love to help make your dreams come true. At Bontrager Builders Group, we love building in all kinds of environments and terrains, but there is something exhilarating about building or renovating a beautiful home on the water. One of our favorite accomplishments is this outdoor beauty that sits right on the water. It features an expansive patio, spacious seating areas, an outdoor kitchen, and a luxurious pool that’ll knock your socks off. This home mirrors a beach atmosphere with its blue pool and sandy color scheme. We feel like we are standing on the shore at Pensacola Beach! This outdoor paradise looks fantastic at twilight because of its illuminating light fixtures and deep-blue pool. A hot tub sits above the pool, its water flowing in and out, just like the ocean. In addition, the sand-like patio is a light color not only because it looks like a beach but also because it keeps this outdoor space cool during the summer time. Also, we love the blue tile that covers the sides of the hot tub; the different shades of blue coming together is in keeping with the ocean theme at this property. Details are very important to us at Bontrager Builders Group, and we always make sure to put our maximum effort into making each and every project unique. Take a look at this stunning outdoor kitchen! The appliances are all stainless steel and seamlessly blend into the stone counters. The sandy color scheme is also extended to the kitchen, with the stone and tile adding subtle color and texture variety. The view from the kitchen is extraordinary. The homeowners can make their dinner while taking in the scenic ocean views and then eat at one of several seating options either in the kitchen or on the patio next to the roaring fire in the elegant bonfire pit. No luxury was spared for this kitchen; there is even a flat screen in the corner! We truly enjoyed creating this space for our client. Let’s talk about this beautiful fire pit. We loved the idea of extending the semi-enclosed kitchen organically on to the patio using deliberate seating arrangements that surround a sophisticated fire pit. The end result is stunning. Our clients are now able to enjoy the ultimate outdoor experience by simply walking through their back door. They have several options for entertainment: the pool, kitchen, fire pit, and the water just beyond their backyard. Imagine relaxing in this serene pool, watching the sky turn pink and orange as the sun sets below the horizon. At Bontrager Builders Group, we advocate that your home should be your sanctuary, and we make every effort to make your home your personal paradise. It was important that we made this project visually interesting because of the neutral tones used throughout the property. However, we were able to mix up the space using different shades and textures to break up long stretches of space. In addition, we positioned the pool, kitchen, and fire pit so that the outdoor area would remain optically interesting. We work only with the best to make sure that all of our projects are given the utmost care and attention. If you’d like to work with us to make your home your safe haven, give us a call at 850-444-9797 to schedule a free, no-obligation consultation. The projects that we take on at Bontrager Builders Group are always unique, important projects, whether that be on a family or a community level. When we remodeled Liberty Church in Gulf Breeze, Florida, we were able to blend the two. The Liberty Church facility is a place where families can come together to create a community. When creating the concept for this space, we made sure to design a facility that meets the needs of the Liberty community while focusing on design, function, and space usage. For Liberty Church, we imagined that the first room that people see when entering the building would be large, open, welcoming, and modern. As you can see, we certainly achieved that goal based on the large, appealing space pictured below. The Liberty Church welcome center is an airy, light-filled room that instantly comforts each guest that steps foot in it. The flooring is functional, yet up to date with current trends. The walls are different hues, and those colors serve to create a scene that encourages children and adults alike to spend time in this room. In addition, there is absolutely enough space for a large crowd of people! The center piece of the room is the wooden backdrop behind the flat screen. At Bontrager Builders Group, we always make sure to honor our clients’ special requests, and this centerpiece is no different. Custom building is our specialty, and you won’t find attention to detail like ours with any other builder in the region. With the right elements, a building can make a huge impression in its visitors, ensuring that a business draws back customers and visitors again and again. Furthermore, restroom facilities can say a lot about a commercial building. When customers use a restroom that is outdated, dirty, or non-functional, their experience with the offending business is negatively affected. As a builder, we never forget the importance of a stylish restroom when remodeling business buildings. We particularly like the design and amenities of the restroom facility below. The blue on the walls provides a calming atmosphere that is much different than the normal, sterile-looking public restrooms found in most commercial properties. The framed mirrors also bring a piece of home into the restroom, showing Liberty Church’s visitors that they are valued and welcomed at their church. One of our favorite parts about working with Liberty Church was the opportunity to create this amazing auditorium. We relish the opportunity to engage in unique special projects, and this space was the perfect chance for us to let our creative juices flow. We enjoyed creating a focal point for the room using a striped backdrop with backlighting and three consecutive screens. Because of the flexible seating in the auditorium, Liberty Church can mold this space depending on how they would like to use it. The stage is functional as well as modern, keeping the atmosphere casual and fun for Liberty Church’s visitors. Also, we love the colors that the screens and lighting produce. They show that this space isn’t meant to be stuffy; people have fun in this room! Besides the welcome center, we created other spaces in Liberty Church that are great for spending time with others. The orange room below is a fantastic space for receptions, parties, and other events. The orange accent wall conveys to church-goers that this room is relaxed and friendly, a space where people can joke and have conversations. The room is also large enough so that there is plentiful standing room for any of the aforementioned events. For our final space, let’s take a look at the Liberty Church game room. This church is all about people making friendships with people who share their values and interests. The lighting in this room is really what makes it pop. If you look at the corner of the photo below, you’ll notice some fantastically unique lighting fixtures. We like ensure that the spaces we build are never generic, that each room we design is unique to our clients’ preferences. For instance, the Liberty Church game room features vibrant red benches that look sleek against their gray backdrop. The splashes of color throughout the room don’t look too intense because of the neutrality of the rest of the space. This room is a great space for children, teenagers, and adults to get to know each other in. If you like what you see, give us a call at 850-444-9797 to set up a free consultation, or shoot us an email at office@bontragerbuildersgroup.com. We’d love to bring your dream space to life! At Bontrager Builders Group, attention to detail is one of our most important goals because unique building features make the best impressions. In each one of our projects, we spend countless hours ensuring that our clients’ projects fit their visions about how their properties should look. For example, we recently completed a remodeling project at Maria’s Seafood Market. The facility is small, but we wanted to make sure that every inch of its interior was functional, yet appealing to customers. In the image below, notice a few things. First, look at the soffit; it features many beautiful black and white images that depict Maria’s history in Pensacola, Florida. The photos are subtle, and they tell a visual story that customers can find themselves engrossed in while sitting on the market’s benches or while waiting in line. The photos are not overwhelming, and they add an aspect of warmth to the building. They show customers just how long Maria’s has been in business, increasing the business’s legitimacy in the eyes of its customers. In addition, the market’s flooring is simple, beautiful, and practical. The color is light, opening the space visually, and the color also ensures that any scratches that show up will not be visible as they would be on a dark floor. Maria’s color scheme is neutral to allow its colorful, fresh products to pop against the subtle background. Red is used sparingly throughout the establishment, but it alludes the market’s branding scheme which features the color prominently. These décor decisions are deliberate and careful, something that Bontrager Builders and our partners maintain a top-notch expertise in. The details in this commercial space are subtle, but they make a huge impact on the flow of the space. The benches in the market maintain the facility’s theme of neutral colors accompanied by pops of color. The blue text on the bench is tasteful because it only outlines the white of the letters spelling out “Maria’s.” The effect of subtle color is an elegant space that attracts new customers and keeps the old ones coming back for more. Next to the bench, the shelves and shelves of vibrant products for sale stand out and draw the eye. The building interior’s neutral elements make the perfect backdrop for Maria’s Seafood Market’s striking items for sale. When a customer enters the market, they see the visual that the image below depicts. The galley-style market creates a long line that makes the space seem larger than it is, and the light colors provide an open, inviting space for customers. They can see the pictures right below the ceiling, the elegant seating, and the mouth-watering products as soon as they walk through the door. Maria’s set up is optimal for customer engagement. The colorful seafood is showcased in stainless steel ice buckets and look appealing when placed against the white background made up of ice. The ice buckets mirror the entire aesthetic of the restaurant: neutral colors that help display Maria’s products in the best way possible. There are many working pieces that must come together to produce a commercial space of Maria’s Seafood Market’s caliber. However, Bontrager Builders Group excels at bringing architects, designers, and subcontractors together to create engaging, charismatic spaces that help businesses grow and excel. Let us know if we can help you transform your business facility into its best, most effective version of itself. According to an environmental report by Marius Dan Gavriletea, “sand is used as a main component in various construction materials such as cement, mortar, tile, brick, glass, adhesives, ceramics, etc. ; and it has an important role in water filtration, in chemicals and metals processing and in the plastic industry.” It’s also used in the construction of various electronic devices such as cell phones and laptops. The average person probably has no clue the massive role sand plays in the modern world. Our lives, homes, and livelihoods are all built with sand. As such, it’s easy to imagine what would happen if the world ran out of the resource altogether. Take a moment, and look outside your window. What do you see? Unless you live a life of complete seclusion in the middle of a forest, you probably see sidewalks, buildings, and streets (yes, asphalt is made with sand too) that are all made out of sand. We might be able to reduce the speed of sand depletion through several avenues. It seems that there may be at least three viable alternatives to using natural sand and gravel in concrete and other construction materials. However, no sand replacement option has been studied in full. Copper Slag is a product of copper extraction that is black in color and similar in texture to natural sand. As a result, a study was conducted by researchers at the S.V .National Institute of Technology in India that tested copper slag’s effectiveness when mixed with powder cement. The researchers found that copper slag cannot entirely replace sand for concrete purposes; however, when the concrete mixture is made up of 40% copper slag, the concrete becomes stronger than regular concrete. After the 40% mark, the mixture weakens and becomes unusable. Recycled Construction Waste is another intriguing substitution for sand being used in construction materials. This way of reducing sand use might be a solution that would allow builders to reuse old material and to not introduce new materials during the construction of new structures. Think of it this way: when a building demolition occurs, what happens to the crumbled concrete that’s left behind? What if we could use those old buildings to make new ones? According to a study conducted by SRM University, “we can conclude that whatever is destroyed can be reused in a more effective manner without causing any damage to the environment.” This statement is heartening, and may encourage scientists and governments to keep an eye out for recycled concrete’s uses. Fly Ash may be another alternative to using sand in concrete and other building materials. What’s fly ash? Concrete Construction defines it as “a byproduct from burning pulverized coal in electric power generating plants.” From that explanation, it sounds like fly ash is a plentiful resource for builders all over the world. In fact, concrete made from fly ash is actually stronger than normal concrete; however, its dry time is slower than its natural sand-made concrete counterpart. Even so, it seems that fly ash concrete may be a solid option for construction as natural sand becomes a non-viable resource for construction use. Sand depletion doesn’t have to be all doom and gloom. However, the topic is not one that many people talk about in the United States or China, two of the greatest users of sand in construction. In fact, if you asked most people on the street if they believed that sand was a nonrenewable resource, they’d probably just give you a blank stare. Most of the research regarding sand alternatives has actually occurred in India, a country that is suffering from the appearances of “sand mafias” as a result of the rapidly rising popularity of the sand trade. As a result, India has much to gain from sand alternatives, but so does the rest of the world. Even though no sand alternative is perfect, each solution presents a way for us to reduce our usages of sand by a significant percentage. As more research is being conducted in the name of finding sand replacements in construction, we must advocate for widespread education regarding the topic and press our governmental leaders to take a look at the issue. Sand depletion is certainly a subject worthy of our attention. Perhaps in the future, some of these alternatives for sand will be common place in the construction field.